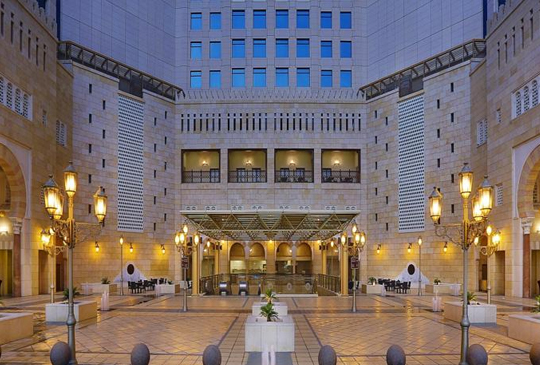 A few minutes walk from the Holy Haram takes you to this exquisite hotel, Hotel Al Tofik Plaza, which is only 10 km away from the Well of Zamzam and Faqih Mosque. With many good restaurants situated in the adjoining areas, a total distance of 110 km is measured from the King Abdulaziz International Airport to this place and a 10 minutes journey by car takes you to the Abraj Al Bait shopping tower from the hotel.The fully furnished rooms of the hotel are equipped with basic and luxurious amenities like refrigerators, coffee-makers, Wi-Fi, and electric kettles. There is 24-hour room service with laundry facility. Staff is amiable and the food is good. Each room is air-conditioned and features a TV, private bathroom, and luxury toiletries. The 24-hour front desk and the alluring gift shop will surely meet your needs. The Prophet’s Mosque is 600 m from Mubarak Al Masi, and Old Bazaar is 400 m away. Prince Mohammed Airport is 8 miles from the property.